저희 연구실의 최근 연구인 The Absence of Resting-state High-Gamma Cross-Frequency Coupling in Patients with Tinnitus가 Audiology & Speech-language Pathology (25개 중 1위) 및 Otorhinolaryngology (43개 중 1위) 저널인 Hearing Research에 게재 허가되었습니다. 이명 환자의 신경과학적 원인이 뚜렷이 밝혀지지 않은 가운데, 본 연구실에서 EEG 뇌파 분석을 통해서, 정상인의 평상시 뇌파에서는 뚜렷이 보이는 전두엽으로부터 두정엽으로의 뇌파 주파수간 동조 현상이 이명 환자에서 사라진다는 점을 세계 최초로 발견했습니다. (아래 그림 참조) 이는 이명 환자가 평상시에 전두엽이 뇌의 다른 지역을 강력하게 제어하지 못하고 있다는 것을 증명하는 결과로, 이명 현상을 이해하는데에 기여를 할 것으로 예상됩니다. 본 연구는 동일한 학술지에 2016년에 본 연구실에서 게재한 Top-down and Bottom-up Neurodynamic Evidence in Patients with Tinnitus' (Hearing Research, 342, Dec 2016, pp. 86-100) 논문과 함께, 청각 연구에서 아직 의문인 의식적 환청 현상인 이명 (Tinnitus)의 인지 신경과학적 연구에 새로운 이해를 제시할 것으로 생각됩니다. Tinnitus is a psychoacoustic phantom perception of currently unknown neuropathology. Despite a growing number of post-stimulus tinnitus studies, uncertainty still exists regarding the neural signature of tinnitus in the resting-state brain. In the present study, we used high-gamma cross-frequency coupling and a Granger causality analysis to evaluate resting-state electroencephalographic (EEG) data in healthy participants and patients with tinnitus. Patients with tinnitus lacked robust frontal delta-phase/central high-gamma-amplitude coupling that was otherwise clearly observed in healthy participants. Since low-frequency phase and high-frequency amplitude coupling reflects inter-regional communication during cognitive processing, and given the absence of frontal modulation in patients with tinnitus, we hypothesized that tinnitus might be related to impaired prefrontal top-down inhibitory control. A Granger causality analysis consistently showed abnormally pronounced functional connectivity of low-frequency activity in patients with tinnitus, possibly reflecting a deficiency in large-scale communication during the resting state. Moreover, different causal neurodynamics were characterized across two subgroups of patients with tinnitus; the T1 group (with higher P300 amplitudes) showed abnormal frontal-to-auditory cortical information flow, whereas the T2 group (with lower P300 amplitudes) exhibited abnormal auditory-to-frontal cortical information control. This dissociation in resting-state low-frequency causal connectivity is consistent with recent post-stimulus observations. Taken together, our findings suggest that maladaptive neuroplasticity or abnormal reorganization occurs in the auditory default mode network of patients with tinnitus. 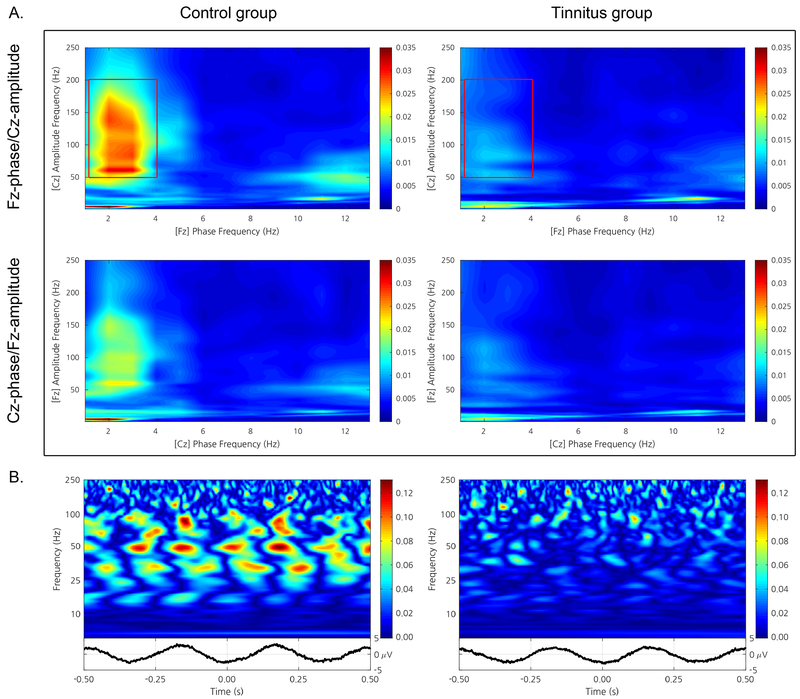 Additionally, our data highlight the utility of resting-state EEG for the quantitative diagnosis of tinnitus symptoms and the further characterization of tinnitus subtypes.